Today in Masonic History Elijah Wadsworth is born in 1747. Elijah Wadsworth was an American soldier and pioneer. Wadsworth was born on November 4th, 1747 in Hartford, Connecticut. He was from a prominent family and was descended from the founders of Hartford. Wadsworth was living in Litchfield, Connecticut when the American Revolution started. He quickly enlisted when the news broke about the Battle of Bunker Hill. 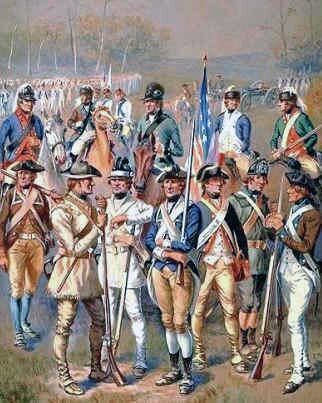 As part of his duties during the war he was assigned as one of the guards for Major John André. André was the British spy who was captured during Benedict Arnold's plot to turn West Point over to the British. André was hung for his role and later Arnold was accused of leaving André to stand alone after his capture. The home Wadsworth built in Litchfield became famous in it's own right after he sold the home after the war and moved to Ohio in 1799. It was purchased by Dr. Lyman Beecher who was the father of noted American abolitionist Harriet Beecher Stowe. In Ohio, Wadsworth had purchased land which was part of the Connecticut Western Reserve, an area that was claimed by the Colony of Connecticut and then by state of Connecticut. He moved to a portion of his properties near Canfield, Ohio after surveying the area that would become Warren, Ohio. The largest portion of his lands became part of Medina County, Ohio. It should be noted that the town of Wadsworth, Ohio was named after him, although he never lived in the town. In Medina County, Wadsworth was involved in organizing the community and local government. He created post offices, schools and a local militia. He was the postmaster in Canfield, Ohio for several years. In 1804, he was chosen Major General of the 4th Division of the State Militia. He was still serving in that position when the War of 1812 started. During the War of 1812, Wadsworth took the opportunity to increase the infrastructure of Ohio. He had several blockhouses built around the state to protect civilians. He also ordered roads to be constructed so that the blockhouses could be interconnected with local roads and each other. He also procured ammunition for the militia. In 1814 he was forced to resign before the War of 1812 was over. This was largely due to declining health. Wadsworth passed away on December 30th, 1817 in Canfield, Ohio. Wadsworth was a member of Western Star Lodge No. 21 in Youngstown, Ohio. He was also a member Old Eerie Lodge No. 3 in Warren, Ohio which was originally chartered under the Grand Lodge of Connecticut. Wadsworth was the master of Old Eerie Lodge in 1803.